BUCYRUS — The Bucyrus Academic Boosters awarded scholarships that honor the memories of two Bucyrus legends, Boyd Long and Larry Heid, during its Academic Awards program in April. The 2018 Larry Heid Memorial Scholarship recipient was Kade Slagle, while the first recipient was Braxen Spears in 2017. The Boyd Long Memorial Scholarship was awarded to Isidora Burling. Larry was very involved in the community through the Jaycees, Bratwurst Festival committee, Advisor to Air Explorer Posts 102 and 113, officer and Fellow of Moose Lodge 669, and poster child for Easter Seals. He was an Eagle Boy Scout and elected to Bucyrus City Council. Boyd Long, who retired from the Bucyrus City Schools, could always be found helping in some capacity at Redmen sporting events. Boyd, who made the ceremonial run with the first bratwurst sandwich to kick off the Bratwurst Festival for many years, helped park buses during athletic events. Larry’s family wanted his scholarship to go to a Redmen basketball player, while the Boyd Long Scholarship recipient had to display a strong involvement in community service like Boyd did for so many years. 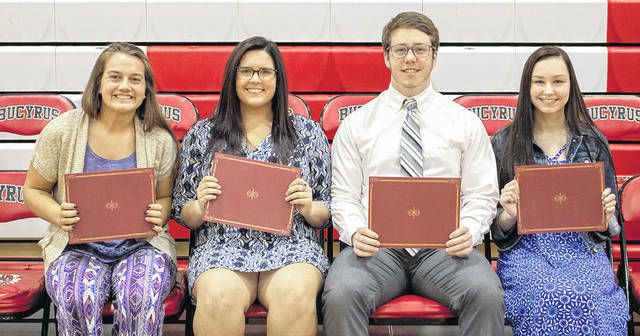 The Bucyrus Academic Boosters also awarded three additional scholarships to Samantha Murtiff, Alexandria Rule and Mason Light.